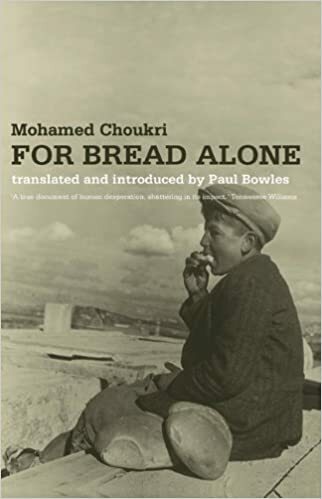 The distinguished writer Paul Bowles, perhaps best known for his novel The Sheltering Sky, collaborated closely with Mohamed Choukri on the translation of For Bread Alone, and penned the introduction. he would be sitting here in my place eating. I’d be just as hard and crazy as he is. I awoke in the Hospital Nacional, breathing slowly. They had pumped my stomach. I could still feel the cramps. His voice reminds me of the needle going into the flesh when the injection is badly given. Her voice: Asleep. He’s got to eat with us. He’s tired. He’s been working very hard with me at the stall. She puts him off. Which is why I do not hate her as I do him, or wish for her death as I do for his.